O Grupo de Pesquisa em Ecologia Florestal foi criado em 2009 com o objetivo de consolidar pesquisas já existentes e atender demandas do Programa de Manejo Florestal Comunitário do Instituto Mamirauá em relação às investigações de aspectos ecológicos da floresta e populacionais dos recursos madeireiros e não madeireiros, associadas ao estabelecimento, acompanhamento e monitoramento de parcelas permanentes. A manutenção das florestas de várzea é o principal foco das atividades do grupo de pesquisa. The tree species pool of Amazonian wetland forests: Which species can assemble in periodically waterlogged habitats? LUIZE, Bruno Garcia et al. The tree species pool of Amazonian wetland forests: Which species can assemble in periodically waterlogged habitats? PLoS One, v. 13, p. e0198130, 2018. NASCIMENTO, Elenice Assis do. Manejo Florestal Comunitário e o Mercado: Aspectos da cadeia produtiva da madeira na região do Médio Solimões. 2015. Trabalho de Conclusão de Curso. (Graduação em Ciências Econômicas) - Universidade do Estado do Amazonas. CONSERVA, Auristela; SANTANA, Denise. G.; PIEDADE, Maria Teresa F. Seed features of important timber species from the floodplain várzea forest. Uakari, v. 9, n. 2 , p. 7 - 19, 2013. TREVISAN, Giselle Vanessa; LIMA, Dayson José Jardim. Relationship Between Water Transparency and Physical-Chemical Variables in Lakes of the Western Amazon, Brazil. Acta Scientiarum. Biological Sciences, Maringá, PR, v. 34, n. 1, p. 13-21, jan./mar. 2012. ANDRADE, Teresinha Maria de. Regeneração de espécies arbóreas em clareiras antropizadas na Reserva de Desenvolvimento Sustentável Mamirauá-RDSM, Amazônia Central. Manaus: Tese (Doutorado INPA/UFAM. Programa de Pós-Graduação em Biologia Tropical e Recursos Naturais. 2012. 91 p.
NUNES, Gustavo Manzon; SOUZA FILHO, Carlos Roberto de; FERREIRA, Laerte Guimarães. Discriminação de Fitofisionomias de Floresta de Várzea a partir do Algoritmo Iterated Conditional Modes aplicado aos Dados SAR/R99 (QUAD-POL/Banda L). 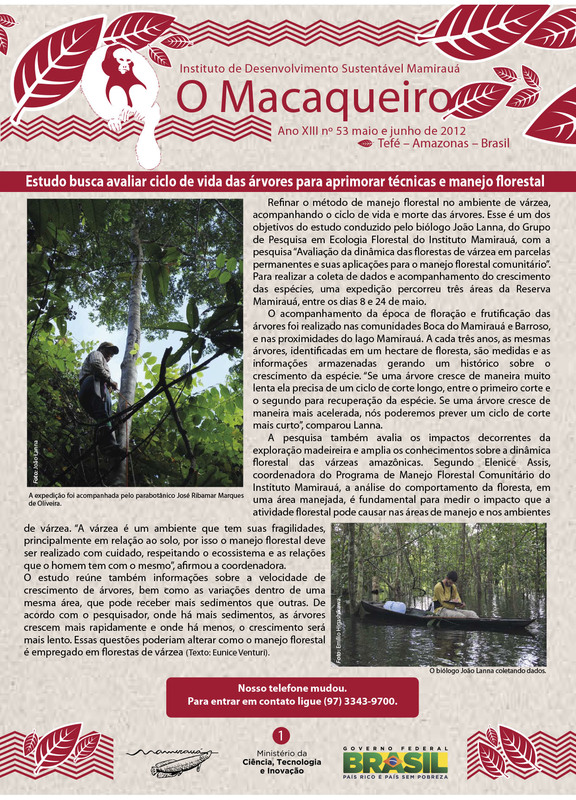 Acta Amazonica, Manaus, v. 41, n. 4, p. 471-480, 2011. AFFONSO, Adriana Gomes; QUEIROZ, Helder Lima de; NOVO, Evlyn Márcia Leão de Moraes. Limnological Characterization of Floodplain Lakes in Mamirauá Sustainable Development Reserve, Central Amazon (Amazonas State, Brazil). Acta Limnologica Brasiliensia, v. 23, n. 1, p. 95-108, 2011. MARINHO, Tatiana Andreza da Silva; PIEDADE, Maria T. F.; WITTMANN, Florian. Distribution and Population Structure of Four Central Amazonian High-Várzea Timber Species. Wetlands Ecology and Management, v. 18, n. 6, p. 665-677, 2010. ASSIS, Rafael Leandro de; WITTMANN, Florian. Forest Structure and Tree Species Composition of the Understory of Two Central Amazonian Várzea Forests of Contrasting Flood Heights. Flora, Publicação online, 2010. WITTMANN, Florian et al. The Amazon Floodplain Demonstration Site: sustainable timber production and management of central amazonian white-water floodplains. Ecohydrology Hydrobiology, publ. online, 14 p., 2009. BEJA, Pedro et al. Seasonal Patterns of Spatial Variation in Understory Bird Assemblages across a Mosaic of Flooded and Unflooded Amazonian Forests. Biodivers. Conserv., publ. online, 24 p., sep. 2009. SILVEIRA, Orlando Tobias; COSTA NETO, S. V. da; SILVEIRA, O. F. M. da. Social Wasps of Two Wetland Ecosystems in Brazilian Amazônia (Hymenoptera, Vespidae, Polistinae). Acta Amazonica, v. 38, n. 2, p. 333-344, 2008. SCHÖNGART, Jochen. Growth-Oriented Logging (GOL): a new concept towards sustainable forest management in central amazonian várzea floodplains. Forest Ecology and Management, n.256, p.46-58, 2008. ANDRADE, Teresinha Maria de. et al. Padrões de Regeneração em Clareiras de Origem Antrópica na Várzea da RDS Mamirauá, Amazônia Central. Uakari, Tefé, AM, v. 4, n. 2, p. 19-32, dez. 2008. WITTMANN, Astrid de Oliveira et al. Patterns of structure and seedling diversity along a flooding and successional gradient in Amazonian floodplain gradients. Pesquisas, Botânica, n. 58, p. 119-138., 2007. WITTMAN, Astrid de Oliveira et al. Germination of four Low-varzea tree species. Aquatic Botany, n.86, p.197-203, 2007. SCHÖNGART, Jochen et al. Management criteria for Ficus insipida Willd. (Moraceae) in Amazonian white-water floodplain forests defined by tree-ring analysis. Annals of Forest Science, v. 64, n. 6, p. 657-664, 2007. SCHONGART, Jochen; JUNK, Wolfgang J. Forecasting the Flood-pulse in Central Amazonia. Journal of Hydrology, n.335, p.124-132, 2007. FERNANDES, Marcus E. B. et al. Efeito da Construção da Rodovia PA-458 sobre as Florestas de Mangue da Península Bragantina, Bragança, Pará, Brasil. Uakari, v.3, n.1, p.55-63, jun. 2007. WITTMANN, Florian; ANHUF, Dieter; JUNK, Wolfgang J. Tree Species Composition and Diversity Gradientes in White-water Forests Across the Amazon Basin. Journal of Biogeography, v. 33, n. 8, p. 1334-1347, 2006. WITTMANN, Florian et al. Wood Specific Gravity of Trees in Amazonian White-water Forests in Relation to Flooding. IAWA Journal, n. 27, p. 255-268, 2006. LUZ, Petterson Baptista da et al. Desenvolvimento de Rhapis excelsa (Thunberg) Henry ex. Rehder (palmeira-ráfia): influência da altura do recipiente na formação de mudas. Ciência e Agrotecnologia, Lavras, v. 30, n. 1, p. 31-34, jan./fev. 2006. WITTMANN, Florian; PAROLIN, Pia. Aboveground Roots in Amazonian Floodplain Trees. Biotropica, v. 37, n. 4, p. 609-619, 2005. CRAMPTON, William G. R.; THORSEN, Dean H.; ALBERT, James S. Three New Species from a Diverse, Sympatric Assemblage of the Electric Fish Gymnotus (Gymnotiformes: Gymnotidae) in the Lowland Amazon Basin, with Notes on Ecology. Copeia, n. 1, p. 82-99, 2005. WITTMANN, Florian; JUNK, Wolfgang J.; PIEDADE, Maria T. F. The Várzea Forests in Amazonia: flooding and the highly dynamic geomorphology interact with natural forest succession. Forest Ecology and Management, n. 196, p. 199-212, 2004. SCHÖNGART, Jochen et al. Teleconnection Between Tree Growth in the Amazonian Floodplains and the El Niño-Southern Oscillation Effect. Global Change Biology, v.10, n.5, p.683-692, 2004. PAROLIN, Pia et al. Tree Species Distribution in Várzea Forests of Brazilian Amazonia. Folia Geobotanica, n. 39, p. 371-383, 2004. CAMARGO, M.; ISAAC, V. J. Food Categories Recostructing and Feeding Consumption Estimates for the Sciaenid Macrodon ancylodon (Bloch & Schneider), and the Congeneric Fishes Stellifer rastrifer (Jordan) and Stellifer naso (Jordan) (Pisces, Perciformes) in the Caeté Estuary, Northern Coast of Brazil. Revista Brasileira de Zoologia, Curitiba, v.21, n.1, p.85-89, 2004. WITTMANN, Florian; JUNK, Wolfgang J. Sapling Communities in Amazonian White-Water Forests. Journal of Biogeography, n. 30, p. 1533-1544, 2003. SCHONGART, Jochen et al. Phenology and stem-growth periodicity of tree species in Amazonian floodplain forests. Journal of Tropical Ecology, Reino Unido, n.18, p.581-597, 2002. ALBERT, James S.; CRAMPTON, William G. R. Five New Species of Gymnotus (Teleostei: Gymnotiformes) from an Upper Amazon Floodplain, with Descriptions of Electric Organ Discharges and Ecology. Ichthyol. Explor. Freshwaters, München, Germany, v. 12, n. 3, p. 241-266, oct. 2001.